Michael has a Master Degree in Culinary Art, (1984 in Munich, Germany) and worked in the capacity of Executive Chef in various restaurants and hotels in Europe and the Gulf in the 80s, including the Hyatt Belgrade and the Hyatt Dubai, Before moving to the East. Two restaurants, the Berlin’s Steinberger Hotel and Ente vom Lehel, Wiesbaden, Germany received a Michelin Star each when Michael was their Executive Chef. He was the Executive Chef in the Bali Hyatt from 1991 to 1994 before becoming Director of Food and Beverage until the end of 1996 when he founded M&M catering. Michael is passionate about the F&B industry, especially in employing new ideas in restaurant design and management. Francois has worked as the Executive Chef and Corporate Pastry Chef with some of the greatest hotels and restaurants in the world. These include Le Caprice and the Inigo Jones restaurants in London between 1982 and 1985, Le Louis XV, a three Michelin Star restaurant, in the Hotel de Paris. In Asia, he has worked as a chef and consultant for the Amanpuri, Banyan Tree and the Chedi in Phuket, Thailand, the Dharmawangsa Hotel in Jakarta and The Legian in Bali. Francois is a culinary artist with a passion for experimentation both with flavour and technique. With this expertise, he is discerning and thorough when it comes to hiring and training of our kitchen staff in the preparation and presentation of food. An English major with a background in client supplier liason in the shipping industry. Emma’s passion for excellence and positive attitude has made her a pillar of strength and accountability for the team since she joined M&M in 2001. Emma handles every aspect of the M&M catering accounts from the first point of contact, delivery to post production. Her gift of assessing a client’s needs and matching them with the right balance of food couture and service style ensures operations run smoothly and to plan. Phina kicked off her career as a freelancer for M&M and has now become an invaluable asset to the company. With a degree in English, extensive knowledge in technology and natural administrative flare, Phina is the one who connects the dots and ensures that ideas and operations are efficiently executed. As the youngest member, Phina’s cheerful and positive attitude to life, brings a refreshing dynamic to the team whilst keeping us in touch with market trends. Ari joined M&M in 2011. He has a degree in hotel management and studied at the Sahid Tourism Academy in Solo, Central java where he is from. Ari started his F&B career in 2004 as part of the pre-opening team at Grand Flora Kemang Jakarta in the Banquet Department. Then in 2005 spent three years at BanyanTree Bintan as the supervisor for both their signature Fine Dinning restaurants, Saffron and Mediteranian Cove. In 2008, Ari moved to Bali where he worked at The Hard Rock Hotel and Banyan Tree Ungasan. A dedicated team member with a calm manner and an eye for detail. Ari always encourages the team to do ‘service with the heart and exceed customer expectation’. His Moto is “Never assume, always check and re-check!”. Growing up in Singaraja, Bali, Joe already has been cooking in elementary school, experimenting and enjoying food ever since. Starting his professional career in 2004 as a kitchen assistant in the Grand Hyatt, Nusa Dua, he then explored multiple cuisines and food venues all over the island. Having been scouted by reknown chef Chris Salans, he became an expert in butchery and mastered the range of à la carte service as chef saucier and poissonier at Mozaik Restaurant, Ubud. After refining his skills in Métis Restaurant, Seminyak, he joined M&M as executive chef in 2016. Joe is an expert for Balinese products and traditional cooking techniques. 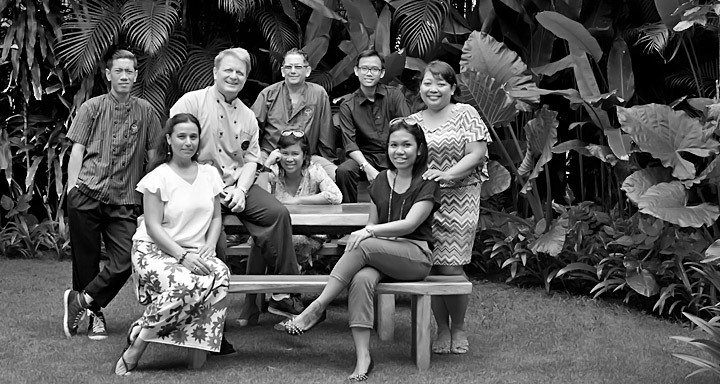 Being also trained in Western cooking styles, enabels him to create our New Bali Cuisine. As a perfectionist his favourite is to prepare sauces, meat jus in special, „because it needs so much patience, dedication and love“.